Most systems designed for the symbolic verification of security protocols operate under the unproved assumption that an attack can only result from the combination of a fixed number of message transformations, which altogether constitute the capabilities of the so-called Dolev-Yao intruder. In this paper,we show that the Dolev-Yao intruder can indeed emulate the actions of an arbitrary symbolic adversary. 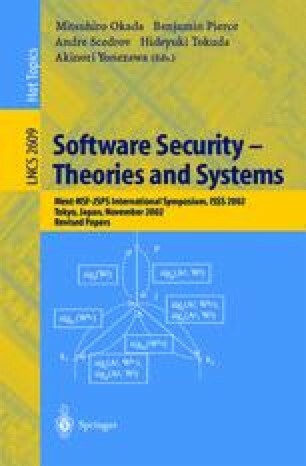 In order to do so, we extend MSR, a flexible specification framework for security protocols based on typed multiset rewriting, with a static check called data access specification and aimed at catching specification errors such as a principal trying to use a key that she is not entitled to access. Partially supported by NRL under contract N00173-00-C-2086 and by NSF grant INT98- 15731.